Privately-funded grave marker for Pvt. J.R. Kealoha, created 137 years after his death. Nanette Napoleon is a freelance historical researcher, writer, and Hawaiian cultural specialist. She is most well-known for her extensive work documenting historical graveyards in Hawai‘i. She has been presenting historical and cultural lectures, tours and workshops in the community for more than 20 years. Nanette is currently producing a documentary film titled, “Hawai‘i Sons of the Civil War,” which is about the more than 100 men from the Kingdom of Hawai‘i who fought in the American Civil War. She is also one of the advocates here in Hawai‘i who have been trying to get Civil War veteran, Pvt. 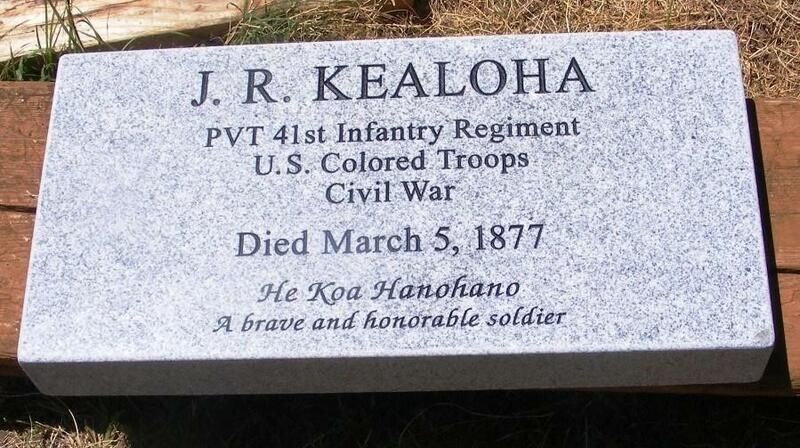 Kealoha, a marker. Suspense stories make great theater when the tension is timed just right: building to a climax that is all the more startling because it’s being acted out live, in front of us. There’s a good deal of craft that goes into keeping that suspense alive, and when it’s applied to a proven winner like Frederick Knott’s play “Wait Until Dark,” the effect is powerful. Lin McEwan plays Susy in the Maui Onstage production of “Wait Until Dark,” which runs from Sept. 26 to Oct. 5, at the Historic Īao Theater. Remember this time last year when HECO told its customers they’d need permission to install their PV systems? Many PV buyers were frustrated and there were warnings of the layoff effect HECO’s edict would have on the PV industry. As we went into the weekend, lawmakers held a briefing to look at the status of the issue now, since about 4500 hundred customers are still waiting. One of the groups to present was the Hawaii Solar Energy Association. Leslie Cole Brooks is its Executive Director and she joined the show with an update on the situation. Dr. Angela Kay Kepler is the author of "The World of Bananas in Hawaii: Then & Now." She’s giving a workshop this Saturday at Maui Nui Botanical Gardens on the best Hawaiian banana varieties to plant, and the keys to their healthy maintenance.